Oh good grief! I just realized that this post has been sitting in my drafts since *last* Saturday night. That's the kind of week it's been. Ah well, better late than never, right? The CRAFT/Jennifer Perkins party was a total blast. 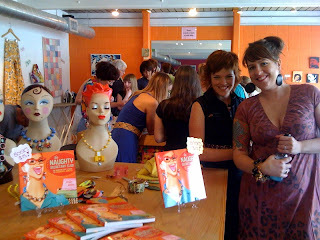 There were loads of great folks - all ages, all styles, and all ready to get crafty. Jen's book did smashingly well, we sold some CRAFT subscriptions (and remember, when you get a CRAFT subscription, you can get a free adult day pass to Maker Faire Austin. That's a crazy good deal - those suckers are $25 a pop!) and we ate pink and aqua cupcakes. It doesn't get much better than that. Jen was a total dream boat, and I was so happy to finally meet her in person after emailing with her for months and months. She's as down home sweet and fun as you would expect. On to the thank yous and other random bits from the party! First off, some fantastic volunteers. These gals helped greet folks, hand off raffle tickets, sell subscriptions, and helped guests make the fabric covered button ring projects. I can't thank them enough. They are (l to r) Misty, Jamie, Niku (of Lovely Letterbox fame) and Jennifer (of Textile Fetish - who also donated an adorable apron for the door prizes). Not pictured are also Sarah and Anne Marie. Next is just a sampling of the cool folks who came to the event. I watched this mother/daughter pair throughout the party, and thought it was so cool to see them there together. I could tell the daughter was just a few years older than my daughter, and she just seemed .... so cool and fun. It made me a little excited for seeing my daughter at that age. She was so cute throughout the party - mingling, talking with Jennifer, making stuff - and when I'd do door prize drawings, she'd sit there, clutching her ticket, dying to win something. Toward the end, I could tell she was about to leave, and when I happened to draw her mom's ticket as a winner, I invited her over to the table to pick something out as well. I couldn't let her go home empty handed. As you can tell, I was quite smitten with them. Avery's mom, D'Wanna, is also crafty and seeing the mother/daughter duo out on a crafty adventure just set my heart all aflutter. I mean, how adorable are these two? If you missed the party, don't fret! You can catch Jennifer and her sister at Bazaar Bizarre at Maker Faire Austin in October. Go ahead and hop over to order your CRAFT subscription so you can score a free adult day pass - it's a deal you cannot pass up. Screen Print Rub Ons went FAST! Loads of fun, happy crafty people. party. We're about to do another raffle drawing ... Gotta run! We're just a little more than 24 hours out from the Craft08/Naughty Secretary Release party, and folks - this is gonna be a humdinger of an event. We'll have all kinds of cool goodies from CRAFT to giveaway, great deals on subscriptions, and - of course - we'll be celebrating with one of the coolest crafty gals around, Jennifer Perkins of Naughty Secretary Club. 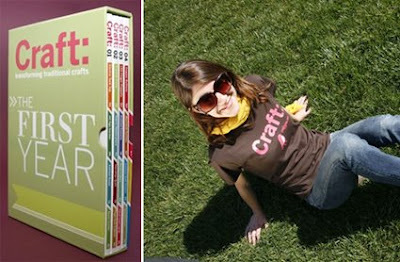 Jenny Ryan from Craft Magazine will have a book review and Crafty Q&A with Jen up on the Craftzine blog later today. Check it out! You've heard me go on about how cool Jen's new book, The Working Girl's Guide to Handmade Jewelry, is, and part of what makes it so cool is all the neat stuff she uses in it. 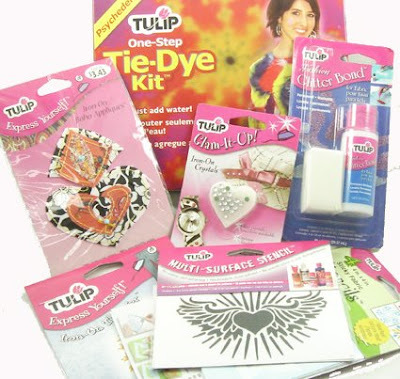 You'll have the chance to get your hands on some of the very supplies she used in the book, as well as some of her other favorite craft supplies at the party. She's scored loads of amazing door prizes and if you can't make the party, you still have an opportunity to get your hands on these goods, 'cause she's doing a tandem giveaway over on her blog. Does the goodness ever stop? Really. Here's a preview - hop over to Jen's blog for even more pictures and descriptions, and - better yet - make sure to be at the party tomorrow night. Hooray! Crafty Chica stuff! And did you know you could win a spot on the Crafty Chica Cruise? More Hooray! 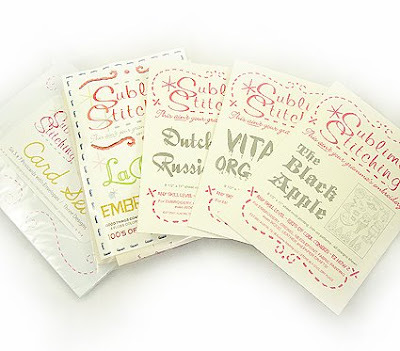 Sublime Stitching Stuff! Must.Stitch.Ovaries.STAT. I've seen Complete Embellishing by Kayte Terry reviewed on several blogs, and wanted to give my two cents as well. I've been reading through the book for a little more than a week now (remember my habit of reading craft books cover to cover? yeah. Gets time consuming!) I haven't been able to read *every* page, but I've read a lot, and what I've read - I've liked. A lot. Physically, the book is fantastic. It's large, hard covered and has a spiral binding (hoorah for spiral binding!). It almost feels like a text book for a very cool textile class. The full color pages are yummy and easy to read. The photographs are beautiful (a few are repeated in the book) and the step by step writing is clear and easy to follow. The first part of the book covers instructions for various embellishing techniques like appliqué and embroidery - two of my favorite things. I love that the embroidery stitch diagrams are so large! 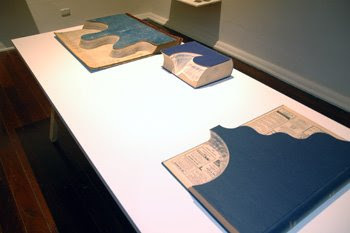 I always wondered why books make stitch diagrams so small. These are big, colorful and easy to understand. The projects that follow in the book are fresh and stylish. Terry's background as a Visual Manager for Anthropologie comes through in the projects. They have that handmade, but uber cool feel to them. I love it. The Romance Skirt - I don't know how often I'd wear a full taffeta skirt, but this project kinda makes me want to get one into my wardrobe. Appliquéd with floral fabric, free stitched and dotted with sequins, it's snazzy without being too flashy. The Pearl Button Purse - Button projects abound in the craft world, and why not? 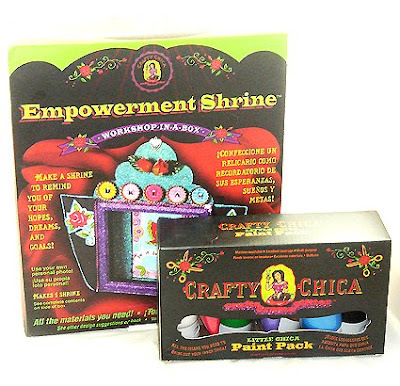 They're fun, versatile and can use up a notion that most crafters have in mass quantity. This purse is one of the more formal button projects I've seen, and is gorgeous. A lot of it has to do with the purse she's adorned, but if you can find something even remotely close, it'd be a fun, easy project to tackle. The Vintage Appliqué Dress is perhaps my most favorite project I've seen in a long, long time. My jaw literally dropped when I saw it and realized what she'd done. It's brilliant. She's taken bits of vintage embroidered linens and appliquéd them at the waist and neckline of a cool dress. The effect is gorgeous, and makes my embroidery-loving heart skip a beat. I'm dying to try this and maybe even tweak it a little. Overall, I like the fresh projects, unique style and clear diagrams in Complete Embellishing. Its spiral binding and large color format are nice bonus features. 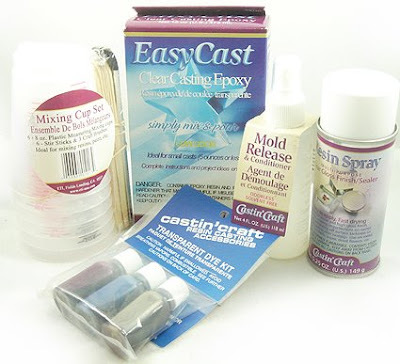 If you're looking for some new ideas for a range of embellishing techniques, definitely pick it up. More fab sewing classes at The Stitch Lab! As if the classes from the Future Craft Collective aren't enough to get you super excited, we're also working on the fall schedule at the Stitch Lab. We'll be working on the newsletter with the new schedule announcements on Wednesday (my favorite day of the week is newsletter day - it's loads of fun) There will be new rounds of the ever-popular Beginning I and Beginning II Series, some more hand embroidery classes from me, and maybe even a few new classes thrown into the mix. 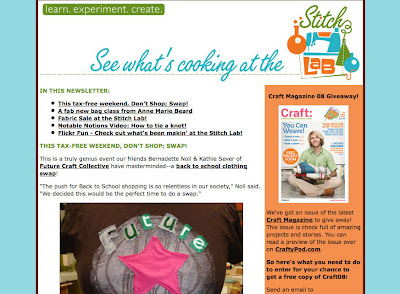 To make sure you are first to be in the know, sign up for the Stitch Lab newsletter over on our web site. The newsletters aren't just schedule updates - we post loads of good information from our Notable Notions series, crafty news from around Austin and beyond, and pictures of Stitch Lab student creations from our Flick gallery. It's an email newsletter you'll actually look forward to receiving - even if you aren't local to Austin! So go sign up for it ... like NOW! I know I spout a lot of love for Kathie and Bernadette of the Future Craft Collective, but it's because they are just so dang awesome. They just sent out their fall schedule, and it is absolutely packed with fantastic classes. 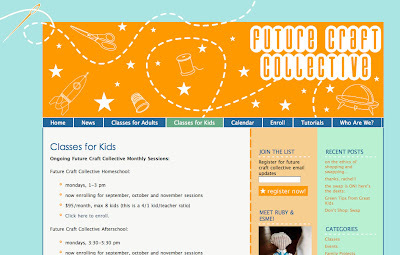 First up, there are some really cool classes for kids. I love that there are options for homeschool kids and for outside-the-home-schooled kids. These are some particularly cool classes. Next up are classes for mamas. I'm re-posting the description from below up here. It almost makes me a little weepy. What a beautiful way to put together classes! These workshops are collectively called Crafting Family Goodness with each one focusing on a different aspect of family life. In addition to learning to upcycle and sustainably sew some incredibly handy items to enhance your family life, we'll discuss ways to make your family life just how you want it to be. We'll talk about creating rituals and establishing rhythms that work for your family. We'll share ideas for ways to slow down and pause now and then to give you a chance to take it all in and make decisions about just how you want your family life to be. Here's the full-on lowdow on their fall schedule, and you can head over to their web site to register yourself or your kiddo(s) in a class. Tell 'em Average Jane sent ya. Homeschool classes: Monday afternoons from 1-3 p.m.
September will focus on making a complete, reusable, washable, upcycled lunch kit that will have you toting your lunch in sustainable style you just won't find in the stores. October is Fashion month during which students will work on different elements of declaring their own style and self-branding to create their own fashion image. We'll work on sewing, embellishing, and fabric printing all the while discussing the benefits of making it yourself and making it your own. The students will also be given the opportunity to participate in a city-wide sustainable fashion show put on by Treasure City Thrift Store. November and December our thoughts turn to gifts and holiday rituals and how we can make it all our very own. We'll make hand sewn gifts for friends and family and holiday decorations and Advent calendars to count down the days the Solstice or Christmas or even New Year's Eve. 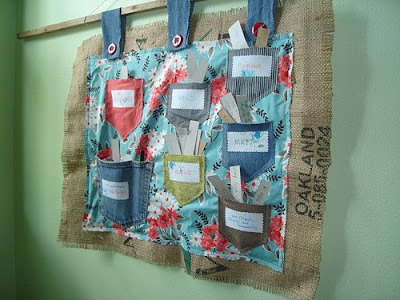 In this class you will make your own upcycled lunch kit to tote your own lunch in sustainable style. You might share it with your kids or you might just decide to keep this one for yourself. This is definitely not available in stores. 3. Birthday Wish Flags - to decorate and honor each member of the family on their special day. This idea was brought to us by a mama friend who got the idea from another mama friend who got the idea because her own mama made her one of these so many years ago when she was just a toddler herself. The Quiet Book is an amazing little cloth book for babies and toddlers to play with and peruse during down time or rest time. 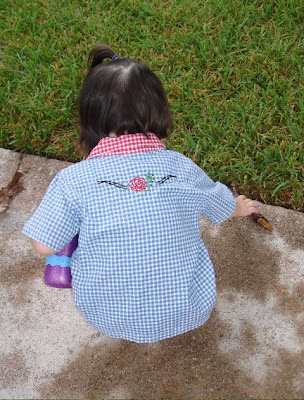 The book focuses on small motor skills such as buttoning and snapping and on the basics of numbers and letters. When you see it you will cry sweet tears. When you make one for your own child or a special child in your life you will feel like the world is indeed a beautiful place. Well, not my mom, she was too busy raising nine kids. But stepping back into our society's crafty past, Kathie will unearth a variety of handsewn toys to choose from. Each one sure to play your heart strings and give you the highly esteemed Crafty Mama award. Your child will thank you and praise you for years to come and be smarter for your efforts*. This beauty will surely become a part of the wonderful celebration around your own family's holiday traditions. Whether you countdown to Solstice or Hannukah or Christmas or New Year's Eve, your family will find beautiful anticipation in the tiny pockets of this crafty project. Do you have a group that wants to craft together? Gather 5-8 friends and we'll be happy to schedule your own Crafting Family Goodness session at a time that works for you. (and for us of course) Group rates available. I mentioned a while back that I'd signed up for the Lovely Letterbox series from Niku. I didn't have time to blog about my first installment of the LLB*, but my second one came over the weekend and I can't *not* share it. It made me so giddy! First off, check out the envelope in which it's delivered. 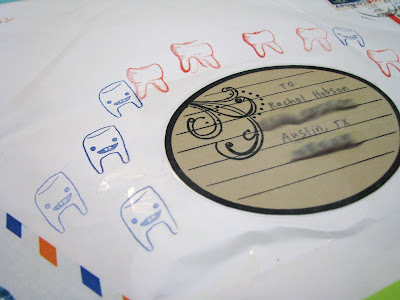 How could you not be happy to see a package like this peeking out from your tiny mailbox? I get so insanely sick of ads and junk mail that this little bit of art in my mailbox really lifts my spirits. Included in this month's installment was a zine that Niku made during the 24 hour zine challenge. It is beautifully written, and very heartfelt and personal. I have to admit, I teared up when I first read it. I felt very lucky that she decided to share it. She also included some scraps of fibers and a piece of screen that was part of a piece she included in an art exhibit that she organized at the Starbucks where she works. I can't wait to do something with it! It's so cool to think of it as a piece leftover from something she made. I don't know why, but it just feels like it already comes with some pretty special meaning attached. 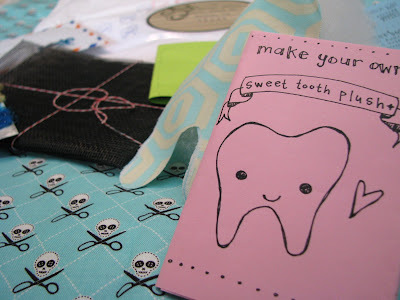 She also included a fun little kit to make a tooth plushy in honor of her new brand "Sweet Tooth Designs" It's so cute! 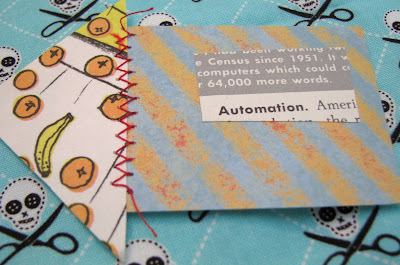 Also in the mix was a cool little stitched business card. Love that! Finally - some amazing teeny shrink plastic buttons with sewing machines drawn on them. These had me swooning. If Niku continues the Lovely Letterbox past this initial round, I can not encourage you to sign up enough. It's made my usually dreary mailbox *much* happier. Don't you know it's rude not to share? 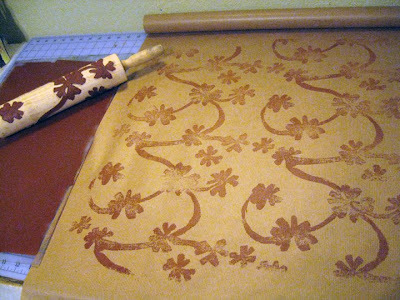 Rolling Pin Prints from Craft Chi - can you say, "BRILLIANT!"? See? Mom was right: sharing is a *very* nice thing to do. Enjoy! Over the last 10 days or so, I've been lucky to have received great emails from some of the folks who have taken one of my embroidery classes this summer. I have been floored by the amazing stuff these lovely ladies have done since class. They are total rock stars with their stitchery - I'm so proud! Fortunately, they've agreed to let me share their handiwork with my blog reader(s). First up was Amy, whom I met several years ago when I lived in a suburb of Austin. I was so excited that she came to take the class - mostly because I almost never get to see her anymore - but it turns out she took way more from the class than just some fun social time. She sent pictures of some tea towels she's been working on as a gift set. Check out that amazing chain stitch. Chain is one I always struggle with, but not Amy. She has spanked chain and let it know who's boss. (heh. I just think that's a funny visual) You've gotta click on this one to view large to see what I mean. I also love that she's using a ready-made towel and not just adding an image, but also embellishing the lettering on the towel. It's a simple little addition, but it makes a huge impact. I love it. And now to Martha. Here's what Martha had to say in her email after the class: "I have not had a chance to do a LOT of embroidering since, but I've made a few items. I'm sure they look very rookie-ish but thought you might be interested in seeing what you all have started." Um ... no. Not "rookie-ish" at all. 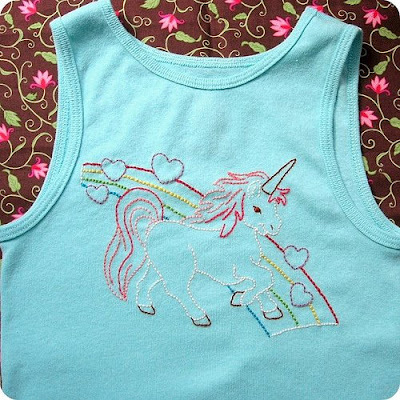 My jaw hit the ground when I saw this adorable shirt she embellished. I want one for myself! And look at these adorable tea towels! 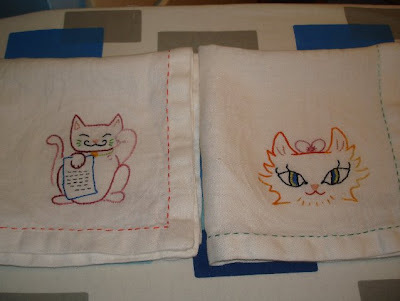 I love the verigated floss on the cat, and I love the detail of the running stitch around the border of the towels. Fantastic! Finally, there's Jodi (who's due to give birth any minute now!) Jodi is a good friend of mine who wanted to learn embroidery during her months-long "nesting" phase. She had visions of embroidering the placemats and cloth napkins her daughter needed to take to Montessori school. Her daughter started back to school this week, and check out the stinkin' adorable placemats she took with her. Aren't they fantastic!? And one is using one of the vintage embroidery patterns I only posted last week! Jodi is *fast*, y'all! More than the fabulous projects I've seen, though, have been the incredibly nice and enthusiastic comments about their experience in the class and after the class. I love seeing folks get so excited about crafting - especially embroidery - and I love seeing them make practical applications of their new - fun - skill in their lives. It warms my heart! I just taught another class this past Tuesday, and already one of the students has emailed to say she went through her house the night after class to find a pillow case on which she could start embroidering. Hallelujah! The embroidery revolution lives on! heh. It's the little things that I like. Speaking of the Naughty Secretary Club book ... a review! OK, so it's no secret that I'm a big fan of Jennifer Perkins and The Naughty Secretary Club. I love Jen's aesthetic, and her big Texas personality, and - I have to admit - I'm quite smitten by the fact that she and her mom and sister are all so tight ('cause I'm the same way with my mom and sister). So I'll admit I had a little bit of a bias when I received a copy of her new book, The Naughty Secretary Club: The Working Girl's Guide to Handmade Jewelry. I knew I'd love it, but - dang - I had no idea I would love it *so* much. Let's talk physical attributes: The book is square - it's a great size, and its colorful, crazy, kitschy design is off-the-charts fun. 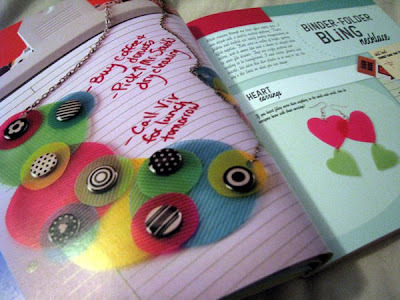 If you've watched Jen on Craft Lab, read her blog or kept up with her jewelry design at all, you can easily feel her presence on every page. Now on to the projects: I wasn't sure how many office-related projects someone could come up with, so I was weary about what kinds of things would be in the book and if they'd be something I'd actually want to make. Let me say: I want to make almost every single thing in this book. Like now. They are fun, cute and most seem totally doable with little learning curve. 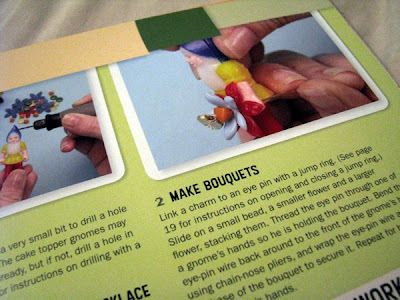 I love details like the fact that on the gnome necklace, it wasn't enough just to string gnomes on a necklace, she's added boquets to their little gnome hands. And the fabric covered button rings look like a great instant gratification project*. The Secretary's Delight bracelet & ring set has made me absolutely hungry to try resin casting. 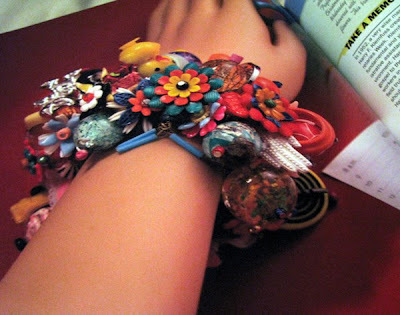 The one I really covet, though, is the Secretary's Day Bouquet bracelet. I've admired (ok, drooled over and dreamed about) Jen's cha-cha bracelets for ages, and she's actually showing how to make them in this book. Yup. I'll give you a minute to run over and order it, 'cause I know you want to now. And now on to the writing. I have this weird thing about reading craft books cover to cover before I start any projects from them. I'll sit and read through them page by page and night - reading all steps, materials lists and filler info. I'm geeky that way. This one was loads of fun to read. Jen's writing and style make you feel like you're hanging at Huts having a milkshake and onion rings. It's funny and informative and not in any way boring. Big bonuses. And her introduction and acknowledgments that spew love for her family make me a little teary and love her even more. This is a great fun book that will make you want to try new things, and look at everyday objects in a new way: just searching out a place where you could drill a hole in it and make it into your latest bauble. 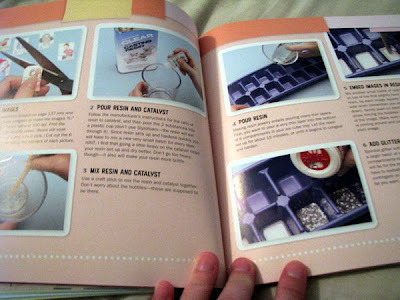 * And these are the projects we'll be making at her book release/Craft08 release party! I mentioned this in a previous post, and more details will come over the next week and a half, but I am THRILLED to announce that I'll be hosting the Craft08 Release Party in conjunction with the book release party for Jennifer Perkins' The Naughty Secretary Club: The Working Girl's Guide to Handmade Jewelry. We'll be celebrating at Craft-O-Rama on Saturday, August 30 from 3-6 PM, and we'll be making a project from Jen's new book (which is stinkin' FABULOUS. Really. ). We'll have door prizes, loads of special guests and lots of crafty goodness. Please join us! And, if you'd like to help spread the word, just email me at averagejanecrafter at gmail dot com and I'll send an evite that you can use to invite your friends! It's like hitting the crafty motherlode - you will not want to miss it - trust me. 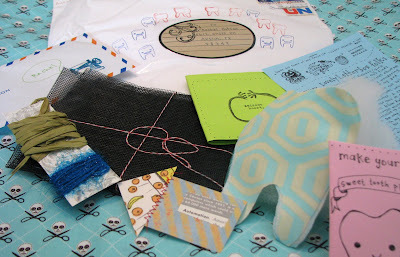 Last month, I was the lucky winner of an anniversary giveaway on Sweet Bee's blog. She's got some great vintage embroidery stuff going on over there. Be sure to check it out. I received my package recently and have been late getting pictures. It was such a delightful package to open and go through! 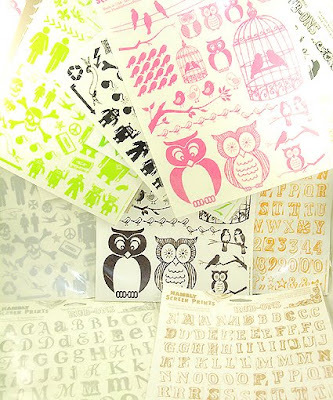 And then some fabulous vintage embroidery transfers. These are just some peeks at my favorite little pieces. But that's about how it was for me. The supermarket was actually a lot of fun to wander through and actually made me want to cook. (what!? Me!? Craziness.) Diane, Lee and I slowly made our way back to the bookstore and started flipping through the books they had out on their "July Japanese Craft Book Fair" table. They were fun, and it was nice, but .... I couldn't find any embroidery books. That's kinda what I was banking on. I played like I wasn't totally devastated, and decided to check out the kids' section to see what other cool stuff I could find for my kids, and then turned down the aisle of ... the.most.fabulous.selection.of.Japanese.Craft.Books.Ever. I scored three books. There were dozens more I coveted, but I just didn't have the budget. As it was, I went a little over board. The typical, stinkin' adorable tiny Japanese embroidery motifs. How amazing is that mane? You might need to sit down, 'cause there's some faint-inducing cuteness coming up. I thought this little finger puppet with a gun was hilarious. Check out this amazing food! Good grief! It's so awesome, I have to include a close-up picture. The raspberry makes me swoon! It's beyond gorgeous, and I can't wait to implement some of the stuff I see in this book. I can't wait to get back to Portland for more Japanese craft book adventures, but until then, I think I'll be able to keep pretty busy with these little gems. 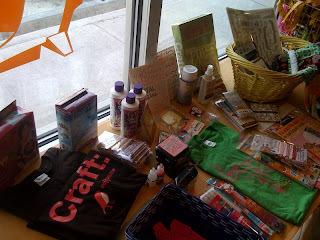 Look who's blogging for CRAFT!